SCHUNK offers as the world’s first manufacturer a comprehensive range of standardized components for the 6-axis lightweight UR robots, which comprises both fields of application, gripping and changing as well as measuring forces and torques. Specially coordinated interfaces and adapters make sure that all of the system’s modules are combinable with UR robot arms and can be quickly exchanged. It’s now as easy to commission the peripheries as it is to program the robot. SCHUNK is now offering an entire gripping system kit consisting of electrically and pneumatically controlled grippers, quick-change modules, and force/torque sensors that is specifically tailored to Universal Robots robot arms. Instead of planning and implementing the electric or pneumatic actuation and the sensor connections individually each time at great expense, the interfaces of the grippers, quick-change modules, and sensors are perfectly adjusted to another within the modular system. All modules are easily connectable via Plug & Work to the robot arms. Neither mounting kits nor external valves are required for this. Furthermore, special plugins will facilitate commissioning in the future, meaning particularly that newcomers will be able to benefit from a fast and uncomplicated entry into process automation. SCHUNK is consistently pursuing the idea of simple automation as represented by UR in the field of gripping systems. The multi-tooth guided and especially precise and powerful SCHUNK parallel grippers PGN-plus-P in the sizes 80 and 100, the multi-tooth guided centric grippers PZN-plus 64, the price-to-performance-optimized universal grippers JGP 80 and 100; the long-stroke grippers KGG 100-80 and PSH 22-1, the electric gripper for small components EGP, and the Co-act EGP-C, designed for collaborative applications. All micro valves for actuating the pneumatic modules are integrated in the SCHUNK adapters. Added to this is the manual change system SHS with integrated air feed-through, electrical feed-through, and optional locking monitoring for gripper change in a matter of seconds. 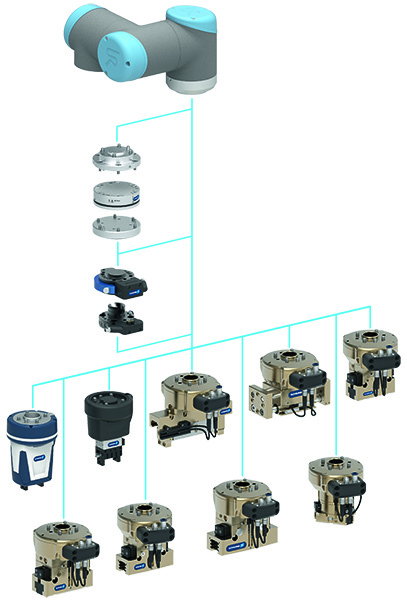 The changing system facilitates a particularly flexible use of the UR arms, as complicated set-up processes are no more necessary, and both SCHUNK grippers and other actuators with ISO-50 flange can be precisely and reliably exchanged in just a few steps. Right from the beginning, an attractively priced force/torque sensor is also included in the SCHUNK modular system kit. The SCHUNK FT AXIA 80 facilitates the precise measuring of forces (resolution 1/10 N) and torques (resolution 1/200 Nm) in all six degrees of freedom. Altogether, the modular program currently enables 36 combination possibilities. With maximum gripping forces ranging from 140 to 930 N and strokes from 6 to 40 mm, it covers a wide range of fields of application, both in conventional automation and in the field of collaborative applications. It is therefore equally suitable for newcomers to automation as well as for professionals in the metal-cutting industry, the automotive industry, and the electronics industry, as well as many other sectors seeking to tap into the potential of automation using UR robots. 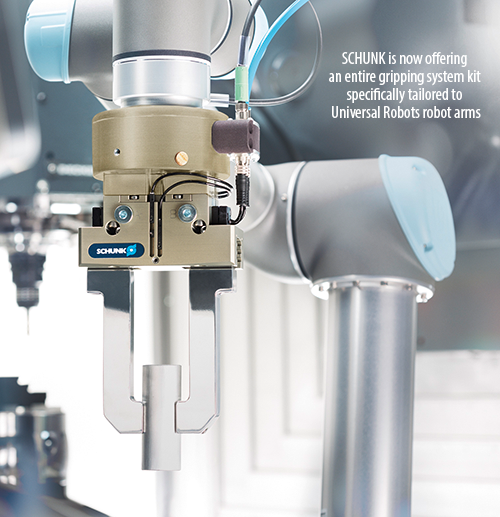 The new SCHUNK End-of-Arm Modular System for Universal Robots. Up to 36 product combination possibilities.